Controller Area Network link module. API for modules implementing specific link types/semantics. MAC-based Virtual LAN link module. Virtual eXtensible Local Area Network link module. Definition at line 38 of file link.h. Allocate link cache and fill in all configured links. result Pointer to store resulting cache. Allocates and initializes a new link cache. A netlink message is sent to the kernel requesting a full dump of all configured links. The returned messages are parsed and filled into the cache. If the operation succeeds the resulting cache will a link object for each link configured in the kernel. Definition at line 1017 of file link.c. References nl_cache_alloc(), nl_cache_free(), and nl_cache_refill(). Lookup link in cache by interface index. Searches through the provided cache looking for a link with matching interface index. The reference counter of the returned link object will be incremented. Use rtnl_link_put() to release the reference. Link object or NULL if no match was found. Definition at line 1052 of file link.c. Lookup link in cache by link name. Definition at line 1084 of file link.c. The behaviour of this function is identical to rtnl_link_get_kernel() with the exception that it will not send the message but return it in the provided return pointer instead. Definition at line 1116 of file link.c. References NLA_PUT_STRING, nlmsg_alloc_simple(), nlmsg_append(), and nlmsg_free(). Get a link object directly from kernel. This function builds a RTM_GETLINK netlink message to request a specific link directly from the kernel. The returned answer is parsed into a struct rtnl_link object and returned via the result pointer or -NLE_OBJ_NOTFOUND is returned if no matching link was found. Definition at line 1165 of file link.c. References nl_pickup(), nl_send_auto(), nlmsg_free(), and rtnl_link_build_get_request(). Referenced by rtnl_link_bond_enslave_ifindex(), and rtnl_link_enslave_ifindex(). Translate interface index to corresponding link name. Translates the specified interface index to the corresponding link name and stores the name in the destination string. Name of link or NULL if no match was found. Definition at line 1207 of file link.c. Translate link name to corresponding interface index. Interface index or 0 if no match was found. Definition at line 1230 of file link.c. Build a netlink message requesting the addition of new virtual link. The behaviour of this function is identical to rtnl_link_add() with the exception that it will not send the message but return it in the provided return pointer instead. This operation is not supported on all kernel versions. Definition at line 1375 of file link.c. Builds a RTM_NEWLINK netlink message requesting the addition of a new virtual link. After sending, the function will wait for the ACK or an eventual error message to be received and will therefore block until the operation has been completed. Definition at line 1404 of file link.c. 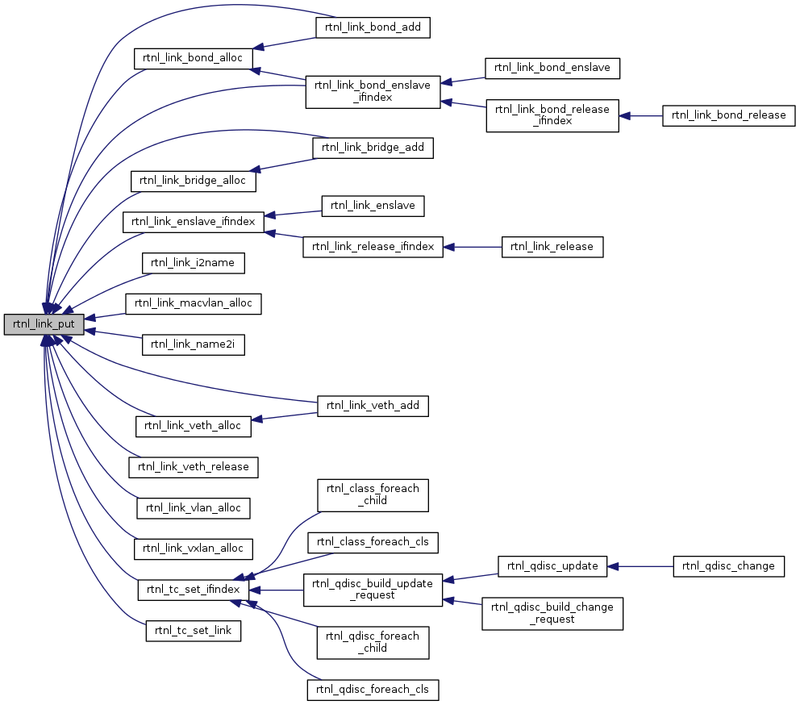 Referenced by rtnl_link_bond_add(), rtnl_link_bridge_add(), and rtnl_link_veth_add(). Build a netlink message requesting the modification of link. The behaviour of this function is identical to rtnl_link_change() with the exception that it will not send the message but return it in the provided return pointer instead. The resulting message will have message type set to RTM_NEWLINK which may not work with older kernels. You may have to modify it to RTM_SETLINK (does not allow changing link info attributes) to have the change request work with older kernels. Definition at line 1436 of file link.c. Builds a RTM_NEWLINK netlink message requesting the change of a network link. If -EOPNOTSUPP is returned by the kernel, the message type will be changed to RTM_SETLINK and the message is resent to work around older kernel versions. The link to be changed is looked up based on the interface index supplied in the orig link. Optionaly the link name is used but only if no interface index is provided, otherwise providing an link name will result in the link name being changed. If no matching link exists, the function will return -NLE_OBJ_NOTFOUND. Definition at line 1503 of file link.c. References nl_send_auto_complete(), nlmsg_free(), and rtnl_link_build_change_request(). Build a netlink message requesting the deletion of a link. The behaviour of this function is identical to rtnl_link_delete() with the exception that it will not send the message but return it in the provided return pointer instead. Definition at line 1549 of file link.c. Builds a RTM_DELLINK netlink message requesting the deletion of a network link which has been previously added to the kernel and sends the message to the kernel. Definition at line 1603 of file link.c. Definition at line 1627 of file link.c. Referenced by rtnl_link_bond_alloc(), rtnl_link_bridge_alloc(), rtnl_link_enslave_ifindex(), rtnl_link_macvlan_alloc(), rtnl_link_veth_alloc(), rtnl_link_vlan_alloc(), and rtnl_link_vxlan_alloc(). Return a link object reference. Definition at line 1636 of file link.c. Referenced by rtnl_link_bond_add(), rtnl_link_bond_alloc(), rtnl_link_bond_enslave_ifindex(), rtnl_link_bridge_add(), rtnl_link_bridge_alloc(), rtnl_link_enslave_ifindex(), rtnl_link_i2name(), rtnl_link_macvlan_alloc(), rtnl_link_name2i(), rtnl_link_veth_add(), rtnl_link_veth_alloc(), rtnl_link_veth_release(), rtnl_link_vlan_alloc(), rtnl_link_vxlan_alloc(), rtnl_tc_set_ifindex(), and rtnl_tc_set_link(). Set name of link object. To change the name of a link in the kernel, set the interface index to the link you wish to change, modify the link name using this function and pass the link object to rtnl_link_change() or rtnl_link_add(). Definition at line 1655 of file link.c. Return name of link object. Definition at line 1669 of file link.c. Set the group identifier of a link object. Definition at line 1679 of file link.c. Return the group identifier of link object. Group identifier or 0 if not set. Definition at line 1691 of file link.c. Set link layer address of link object. The function increments the reference counter of the address object and overwrites any existing link layer address previously assigned. Definition at line 1719 of file link.c. Return link layer address of link object. Definition at line 1733 of file link.c. Set link layer broadcast address of link object. The function increments the reference counter of the address object and overwrites any existing link layer broadcast address previously assigned. Definition at line 1750 of file link.c. Return link layer broadcast address of link object. Definition at line 1764 of file link.c. Set flags of link object. Definition at line 1777 of file link.c. Unset flags of link object. Definition at line 1792 of file link.c. Return flags of link object. Link flags or 0 if none have been set. Definition at line 1808 of file link.c. Set address family of link object. Definition at line 1818 of file link.c. Return address family of link object. Address family or AF_UNSPEC if not specified. Definition at line 1839 of file link.c. Set hardware type of link object. Definition at line 1853 of file link.c. Get hardware type of link object. Definition at line 1867 of file link.c. Set interface index of link object. Definition at line 1883 of file link.c. 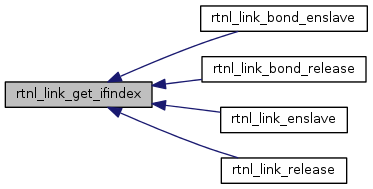 Return interface index of link object. Interface index or 0 if not set. Definition at line 1898 of file link.c. Referenced by rtnl_link_bond_enslave(), rtnl_link_bond_release(), rtnl_link_enslave(), and rtnl_link_release(). Set Maximum Transmission Unit of link object. Definition at line 1911 of file link.c. Return maximum transmission unit of link object. Definition at line 1925 of file link.c. The unit is dependant on the link type. The most common units is number of packets. Definition at line 1940 of file link.c. queue length or 0 if not specified. Definition at line 1956 of file link.c. Set master link of link object. Definition at line 1979 of file link.c. Return master link of link object. Definition at line 1992 of file link.c. Set carrier of link object. Definition at line 2004 of file link.c. Return carrier status of link object. Definition at line 2017 of file link.c. Set operational status of link object. Definition at line 2030 of file link.c. Return operational status of link object. Definition at line 2044 of file link.c. Set link mode of link object. Definition at line 2057 of file link.c. Return link mode of link object. Definition at line 2071 of file link.c. Alias name or NULL if not set. Definition at line 2084 of file link.c. Sets the alias name of the link to the specified name. The alias name can be unset by specyfing NULL as the alias. The name will be strdup()ed, so no need to provide a persistent character string. Definition at line 2101 of file link.c. Set queueing discipline name of link object. Definition at line 2125 of file link.c. Return name of queueing discipline of link object. Name of qdisc or NULL if not specified. Definition at line 2139 of file link.c. Return number of PCI virtual functions of link object. Definition at line 2152 of file link.c. Return value of link statistics counter. Value of counter or 0 if not specified. Definition at line 2168 of file link.c. Set value of link statistics counter. Changing the value of a statistical counter will not change the value in the kernel. Definition at line 2187 of file link.c. Set type of link object. Looks up the link type module and prepares the link to store type specific attributes. If a type has been assigned already it will be released with all link type specific attributes lost. 0 on success or a negative errror code. Definition at line 2210 of file link.c. Referenced by rtnl_link_bond_alloc(), rtnl_link_bridge_alloc(), rtnl_link_macvlan_alloc(), rtnl_link_set_info_type(), rtnl_link_veth_alloc(), rtnl_link_vlan_alloc(), and rtnl_link_vxlan_alloc(). Name of link type or NULL if not specified. Definition at line 2253 of file link.c. Definition at line 2267 of file link.c. Definition at line 2280 of file link.c. Set number of TX queues. Therefore use of rtnl_link_set_num_tx_queues() only makes sense in combination with rtnl_link_add() or if the link object is used as a filter. Definition at line 2299 of file link.c. Return number of TX queues. Definition at line 2311 of file link.c. Set number of RX queues. Therefore use of rtnl_link_set_num_rx_queues() only makes sense in combination with rtnl_link_add() or if the link object is used as a filter. Definition at line 2330 of file link.c. Return number of RX queues. Definition at line 2342 of file link.c. Return physical port id of link object. Physical port id or NULL if not set. Definition at line 2353 of file link.c. Enslave slave link to master link. This function is identical to rtnl_link_enslave() except that it takes interface indices instead of rtnl_link objects. Definition at line 2400 of file link.c. References rtnl_link_alloc(), rtnl_link_change(), rtnl_link_get_kernel(), rtnl_link_get_master(), rtnl_link_put(), rtnl_link_set_ifindex(), and rtnl_link_set_master(). Referenced by rtnl_link_enslave(), and rtnl_link_release_ifindex(). Constructs a RTM_NEWLINK or RTM_SETLINK message adding the slave to the master and sends the request via the specified netlink socket. The feature of enslaving/releasing via netlink has only been added recently to the kernel (Feb 2011). Also, the kernel does not signal if the operation is not supported. Therefore this function will verify if the master assignment has changed and will return -NLE_OPNOTSUPP if it did not. Definition at line 2455 of file link.c. Release slave link from its master. This function is identical to rtnl_link_release() except that it takes an interface index instead of a rtnl_link object. Definition at line 2474 of file link.c. Constructs a RTM_NEWLINK or RTM_SETLINK message releasing the slave from its master and sends the request via the specified netlink socket. Definition at line 2498 of file link.c. Definition at line 2675 of file link.c. Definition at line 2683 of file link.c. Definition at line 2691 of file link.c. Definition at line 2700 of file link.c. Definition at line 265 of file link.c.